A reproduction of the Henry V's sword hangs over his tomb in Westminster Abbey, England. The sword has been dated before 1422 and has an iron cross and pommel. The blade is pretty plain and the length is 27". 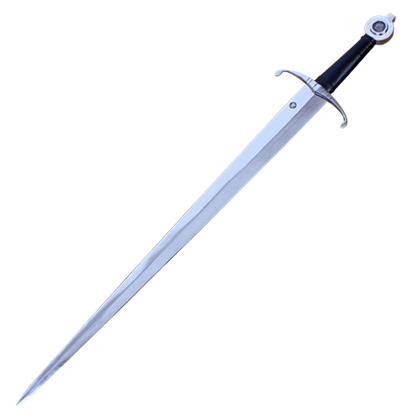 The Henry V sword is has been referred to as the archetype of the medieval swords. Henry V's sword that exemplifies the attributes that a knightly sword of the highest quality can exhibit. It's balance is superb, creating an exceptional fighting sword has awesome cutting ability and excellent point control for thrusting. This sword is the same sword Henry V carried at the Battle of Agincourt. 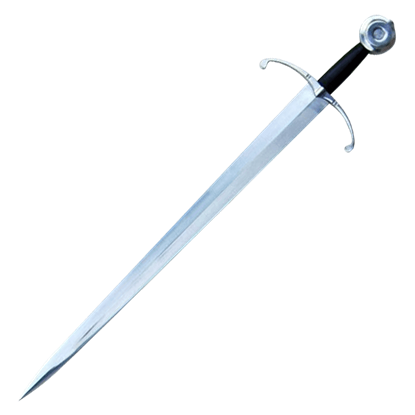 Henry the fifth sword is a royal weapon, it would be an outstanding addition to a sword enthusiast's collection. Our Henry V swords can be used for display or for battle re-enactments, each reproduction is created to the specifications of the original. The dimensions and weight are accurate on every piece so you get a medieval weapon that is actually balanced and fun to hold instead of just pretty to look at. Medieval times were sometimes brutal, sometimes romantic, but always a source of intrigue. We invite you to share in the experience of an era past with our collection of Henry V swords. 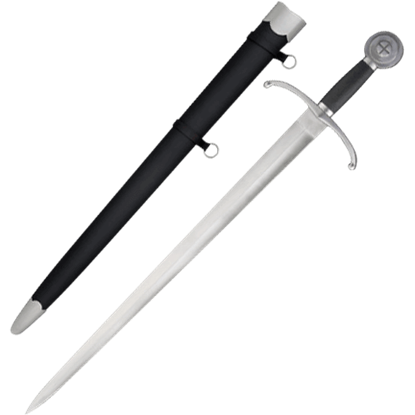 All our Henry V Swords are expertly hand-crafted and authentic replicas! You can display them in your office, home or for Medieval Reenactments. Patterned entirely after its namesake, this Henry V Sword with Scabbard is based on the historical sword owned by King Henry V of England, which he wielded with deft skill in many of his battles fought during the Hundred Years War. Patterned entirely after its namesake, this Henry V Sword with Scabbard and Belt is based on the sword owned by King Henry V of England, which he wielded with deft skill in many of his battles fought during the Hundred Years War. In 1869 a sword was found in Westminster Abbey at the tomb of King Henry V, and it was thought to be part of his funeral armor. This Sword of Henry V is a stunning model of that sword, which has since been placed at his burial site.